How's this for March madness: The fourth nor'easter in less than three weeks is expected to bury parts of the East Coast in up to a foot of snow beginning Tuesday — the first day of spring. About 74 million people were under winter storm watches and warnings from the Great Smoky Mountains of Tennessee through Maine, forecasters warned. Snow will fall Tuesday in parts of the Ohio Valley and the Mid-Atlantic, blast the New York area through Wednesday, and barrel into Boston by that afternoon. For the major cities along the I-95 corridor, forecasters said Washington could get 4 to 6 inches of snow, Baltimore 6 to 8 inches, Philadelphia 8 to 12 inches, New York 5 to 9 inches, and Boston 4 to 8 inches. The spring storm comes as an area from Wilmington, North Carolina, to Florida braced for heavy thunderstorms, damaging winds and possible tornadoes. Severe winds, including at least one tornado, pummeled northern and eastern Alabama on Monday. Fire officials in Jacksonville, northeast of Birmingham, said that numerous homes had sustained significant damage and that fire crews were working to clear roads to get to anyone who may have been trapped in the wreckage. Energy from the Southeast storm is "going to be used to crank up our next nor'easter," Weather Channel meteorologist Jim Cantore tweeted. The pending nor'easter is also likely to be accompanied by sustained winds of 15 to 25 mph and gusts of 30 to 60 mph in some coastal areas, making for a blustery and chilly Wednesday, the National Weather Service said. This system follows in the footsteps of a trio of deadly nor'easters that bashed the East Coast earlier this month. 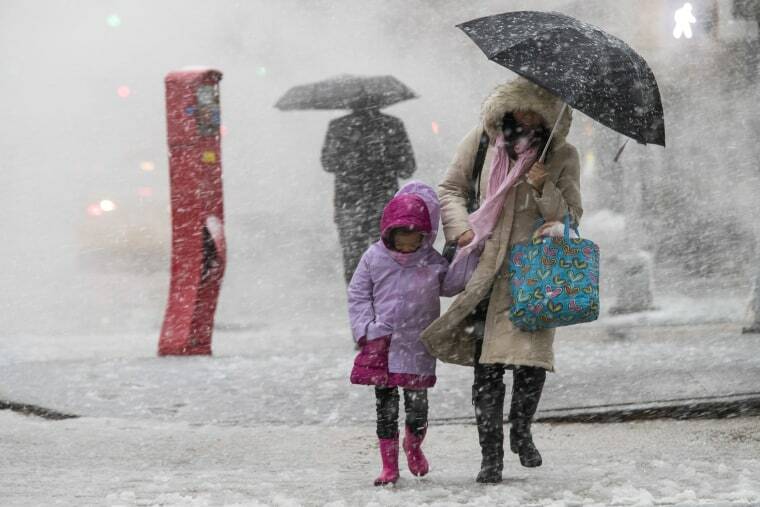 The first nor'easter of the month struck on March 2 and halted flights and caused chaos for commuters. A second nor'easter on March 7 left thousands without power and left up to 2 feet of snow on the ground. The most recent nor'easter on March 12 hammered parts of the Northeast and New England.